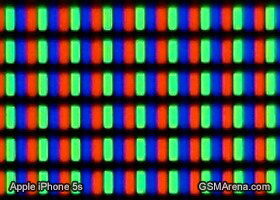 Most of the front is taken up by the 4" Retina display, with the resolution of 640 x 1136 pixels breaking down to 326ppi. It's a LED-backlit IPS LCD, but more on that in the dedicated display chapter. Under the screen sits the good old, but actually brand new, Home button with Touch ID. The fingerprint scanner is essentially a CMOS sensor, which takes pictures of your fingerprint in 500ppi, processed by the A7 chip. Underneath is the familiar home button. A double press will launch the task switcher, while a press and hold will fire up Siri. Above the screen sit the usual earpiece and a new iSight camera. Inside the earpiece Apple has placed a dedicated third microphone, which is used in voice recognition. The front-facing camera features a BSI sensor and larger pixels, but is still stuck on 1280 x 960 stills and 720p video recording. The Touch ID sensor is covered with a capacitive layer under the sapphire crystal, which meets your finger. The button is encircled by a stainless steel frame accent that matches the phone's color option - in this case black to go with the surrounding glass surface. On the left you get the usual three buttons: volume up, volume down and a Mute toggle. The latter is rather stiff, which makes is pretty hard to operate with one hand, even though it's located in a way to comfortably fall under your finger. Then again, probably that was required to prevent accidental pushes, which can potentially result in missed calls. On the right you find the tray, which pops open to reveal the nanoSIM slot. The fact that you need a pin to operate it is hardly ideal, though, particularly if you need to exchange SIM cards on the go. The top of the iPhone 5s hosts nothing but the power/lock button - no fancy IR blasters for remote control of various appliances here. The bottom features the lightning port in the center, the 3.5 mm headphone jack to the left along with the main microphone and single speaker nestled under micro-drilled holes that form two grilles. Apple is using its familiar proprietary screws here so you'll need to get the appropriate pentalobe screwdriver to undo them if you're into to repairing your device at home. The lightning cable that comes with the iPhone 5s (iPhone 5, 5c, 4th-gen iPad and the iPad mini) features an authentication chip so don't go thinking you'd be able to buy just any third party replacement cheaper and use it for backing up or syncing your iPhone 5s - it's not guaranteed to work. The lightning end of the cable can be inserted either face up or down into the iPhone 5s, which is a nice touch. Finally we come to the back of the iPhone 5s. The most notable change, visually at least, is the dual LED flash. It features one white and one amber-colored LED, which in combination should favor more natural skin tones when shooting with a flash. Then there's the new iSight camera. It has seen a sensor increase of about 15% - 1/3" up from 1/3.2" - without affecting the resolution. It's 8MP, just as before, but the pixel size has been increased from 1.4 Âµm to 1.5Âµm, meaning in theory each pixel will gather in more light due to its larger size. To help increase the light intake Apple has also increased the aperture from f/2.4 to f/2.2, while sticking with a 5 element lens. Apple decided that the 4" Retina from last year is still good enough by 2013 standards. The screen is an IPS LED-backlit LCD with a resolution of 640 x 1136 and 326ppi. Apple are using the same display two years in a row, and it will sure want us to take it as a statement, a refusal to give in to the screen size craze. It may have a point as far as screen resolution goes. The iPhone 5s has more than enough of it for this kind of size. But 4 inches of diagonal doesn't quite cut it anymore, not in the premium segment, where power users and heavy multimedia consumers shop. And we're not saying that Apple needs to cross the 5" barrier but are pointing instead to manufacturers like Motorola, which managed to squeeze a 4.7" screen in a device that's not significantly taller or wider than an iPhone 5s. At least some of the space above and below the screen seems wasted. The LG G2, in comparison, has side bezels half the size, while the top and bottom of the 5.2" device are still slimmer. We are not talking proportions either - the iPhone is lagging in terms of absolute values and that takes away a bit of the premium feel. 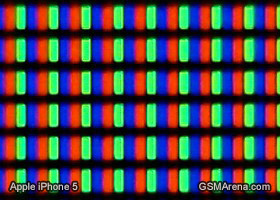 The differences between an iPhone 5s and an iPhone 5 are almost non-existent in the screen department. The black levels are pretty much on par. The brightness seems a little lower on the iPhone 5s and the same goes for contrast but the differences are almost imperceptible to a naked eye and could be a result of some tweaks in the iOS 7 software, compared to iOS 6. 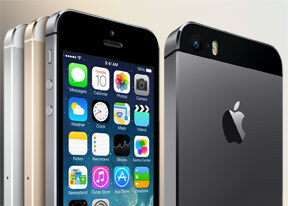 For all purposes practical the iPhone 5s screen can be considered identical to that of the iPhone 5. As far as sunlight legibility goes, due to the slightly lower brightness the iPhone 5s falls a little short of its predecessor. However the contrast in direct sunlight remains excellent, and better than that of its direct rivals. 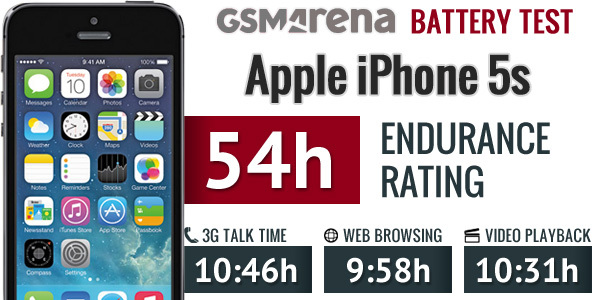 The battery inside the iPhone 5s is of slightly higher capacity, in view of the new 64-bit A7 processor. Last year's iPhone 5 went with 1440mAh, whereas this year we find a 1560mAh unit inside the iPhone 5s. We're be still digging into the iPhone 5s' real-life battery performance but Apple promises the same exact numbers as last year - 250 hours of stand-by, 10 hours talk time on 3G, 8 hours of browsing on 3G and 10 hours on LTE and Wi-Fi. We'll update this page with the results when our test completes.